This Mining Department room is the center of operations for the station's resident asteroid miners, who pull in asteroids with the mineral magnet and harvest the valuable ores contained within. Depending on the shift, these minerals can go to the Quartermaster; so they can satiate the station's endless appetite for space bees and fancy hats; to the Mechanics, so they can outfit themselves as a public armory and give every Staff Assistant at least three guns; or to Robotics, so that the rogue Cyborgs that kill all the crew can have fancy self-charging cells and loads of swanky upgrades. The left half of this room is an equipment room of sorts, a Mini-EVA only for Miners. The racks hold engineering space suits and jetpacks, and there are lockers loaded with essential mining gear. One of the mineral magnet computers is located in here, and next to it is a basic medkit and potassium iodide pills for radiation poisoning from handling radioactive ore, along with a recharger for power picks and hammers. The quantum telescope is located here, so Miners can pinpoint and pull in especially-mineral-rich asteroids. The other half is an ore-processing room that contains various means of transporting ore across the station and processing ore into useful items. There are cargo transporters for shipping crates of ore to cargo pads, a mail chute, a Belt Hell label computer, and, most notably, super-handy cargo chutes for inevitably falling into due to lack of guardrails conveniently sending ore to the Quartermaster. There is also a Mining Fabricator, material processors, and a Nano-fab (Mining) for making custom mining tools. There's also a controller for the shuttle to the Mining Outpost in the maintenance tunnel left of here. There's nothing but rust, dust, and a surprisingly intact mining magnet over there, but, hey, if you're into that, we can't stop you. This Mining Department area is the center of operations for the station's resident asteroid miners, who pull in asteroids with the mineral magnet and harvest the valuable ores contained within. Depending on the shift, these minerals can go to the Quartermaster; so they can satiate the station's endless appetite for space bees and fancy hats; to the Mechanics, so they can outfit themselves as a public armory and give every Staff Assistant at least three guns; or to Robotics, so that the rogue Cyborgs that kill all the crew can have fancy self-charging cells and loads of swanky upgrades. The room connected to the station is an equipment room of sorts, a Mini-EVA only for Miners. The racks hold engineering space suits and jetpacks, the lockers are loaded with essential mining gear, and there is Mining Fabricator and Nano-Fab (Mining) for making and refining ore into more advanced tools. The quantum telescope is located here, so Miners can pinpoint and pull in especially-mineral-rich asteroids. Below is it is a side dock for the mini-shuttle for Mining Outpost. Above it is the Cargo Bay hangar, which comes with a few industrial pods just waiting to be outfitted with the pod upgrades nearby. The little mining shed on the catwalk to the mineral magnet is ore-processing/refinery area of sorts. 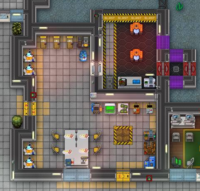 The mineral magnet control computer is in here, and there are crates and cargo transporters for shipping ore to cargo pads, a Belt Hell station, and Mining's very own arc smelter, with accompanying Nano-Fab (Refining) and material processors. The little corner below contains a locker of welding supplies and a table with not one, but two medkits. For hopefully obvious reasons, there is no vent. The equipment room's APC is on its left wall, behind the Mining Nano-Fabricator. The little mining shed's APC is on its southern wall, which is called the Refinery APC. This little cubbyhole right across from Cargo is the Mining Department, the base of operations for the ship's resident asteroid miners, who pull in asteroids with the mineral magnet and harvest the valuable ores contained within. On a good shift, these minerals may go to the Quartermaster to be sold for handsome profits or to Robotics to resupply the diligent Roboticist with metal for their silicon friends. On a bad shift, these minerals may go to the Quartermaster, to line the pockets of black marketers and embezzlers or to Robotics to a diligent Syndicate Roboticist and their (and only their) silicon friends. The Miners gear up and put on their space suits here, and when they come back with their ores, they can send on a neat little conveyor belt directly to Cargo or bring it to the Ore Processing room above to refine and shape it into some lovely industrial furniture. The mineral magnet itself is actually located quite further down, below the maint tunnels under the engine, and the magnet border catwalks are invisible. Yes, this means the miners work right below hell, with engine thrusters blasting just a few feet away, and a real risk of tripping and flying off into space away from the ship always apparent. Pray for these poor souls; when St. Peter calls, they won't come, because they sold their soul to NT. The dock for the mini-shuttle to the Mining Outpost is likewise oddly (and rather inconveniently) placed. Similar to the mineral magnet, the dock is located below a maint tunnel, this time the one below Chemistry and east of Cargo, and the path to it crosses Cargo's pod bay and its mass driver system. Luckily, Miners (and anyone else with maintenance access) can access both these areas, although the trip is nonetheless treacherous. This little corner right below Cargo is the Mining Department, the base of operations for the ship's resident asteroid miners, who pull in asteroids with the mineral magnet and harvest the valuable ores contained within. On a good shift, these minerals may go to the Quartermaster to be sold for handsome profits or to Robotics to resupply the diligent Roboticist with metal for their silicon friends. On a bad shift, these minerals may go to the Quartermaster, to line the pockets of black marketers and embezzlers or to Robotics a diligent Syndicate Roboticist and their (and only their) silicon friends. The Miners gear up and put on their space suits here, and, unlike on other ships, can simply walk through the southern door to get to the mineral magnet. Once they're done harvesting ore, they can place it on the little table open to Cargo for the Quartermaster to pick up or bring it to the Ore Processing room left of the equipment room to refine and shape it into some lovely industrial furniture. Oddly enough, while the mineral magnet and cargo bay are both conveniently close by, the Mining Outpost Shuttle dock is far away on the other side on the station, at the bottom end of the maintenance tunnel east of Medbay. The dock even comes with its own airbridge, apparently so that the shuttle doesn't crash into the catwalk nearby. Mining Department is the "fortress" of the station's colony of Space Dwarfs, located just above the station's colony of Space Owls. These Space Dwarfs tend to industrious but incredibly greedy and, appropriately, usually make their living digging up the riches of the asteroids or salvaging the remains of ships and stations. These Space Dwarfs usually first begin their day by putting on Engineering space suits, helmets, breath masks, jetpacks, and mining belts, which they outfit with various tools and equipment from their lockers. Once suited up, they make a long trek from Mining to an area known as the Refinery and use the mineral magnet controller inside to call in asteroids into the mineral magnet ring, using a variety of drills, hammers, blasters, explosives, and/or picks to break up the rock and harvest the ore and other valuables within. 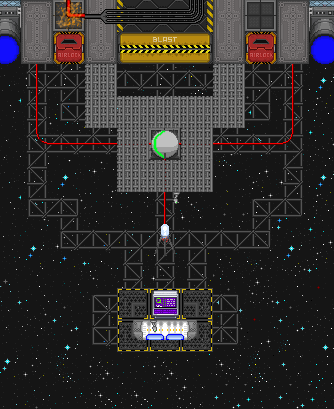 Once the asteroid has been thoroughly stripped of all its useful materials, the ore is taken back into the Refinery, either via ore scoop or mineral accumulator. It can then be sent to various loca tions across the station or processed and refined to make better mining tools, mining pod equipment, or various novelties. In addition, on occasion, these Space Dwarfs may decide to visit their auxiliary "fortress", an outpost in the Debris Field designed to facilitate deep-space expeditions into the nearby ruins and asteroid field. To do so, they simply hop on a mini-shuttle that docks in the maintenance tunnel a little bit northwest of here and use a special computer to call to and from their outpost. Neither the Refinery nor Mining (the area with the Miner lockers) have vents. The APC for the Refinery is on its southern wall, behind the nano-fab. The APC for Mining is just outside the entrance into maintenance. 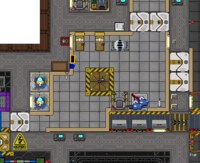 The Mining Department is the base of operations of the station's resident team of asteroid miners, which is unfortunately locked behind Engineering. When they're not busy asking the Engineers to open the doors to their own department, they're usually calling up asteroids via the mineral magnet and harvesting the ores and other riches hidden inside, using a variety of machines and tools. Once they're finished, they then haul it back to the Refinery to make it into better tools and machines and/or give to the Quartermaster/Roboticist/Mechanic. As with Miners with Engineering access, the Mining Shuttle Dock is nowhere to be found here. Instead, it occupies the eastern wing of the Shuttle Bay. The APC for the Refinery area is on the southern wall of the room, behind the material processor. There's plenty of weird and wacky things on this donut. Men in cucumber suits, fat and sassy bees, eldritch sandwich factories, bread made from orange gourds, the list goes on. But among the rarest of the rarest, the least seen of the unseen, are the highly elusive space dwarves. Not much is known about these strange and mysterious beings and their purported colony below the dark maintenance tunnels behind Tool Storage. Our only "reliable" testimony of them comes from the self-proclaimed "lords" of "Cargonia". According to these "Cargonians", these space dwarfs begin their day in a small, ill-lit room where they don special armor that allows them to withstand the extreme coldness and intense radiation of Space. They then venture out into a small outpost, called the Refinery, outfitted with many strange dwarwen machines, including a special machine that uses magnetic forces to pull in asteroids. Purportedly, these space dwarves then ritualistically tear apart these asteroid using a variety of instruments and implements, seeking the precious ores within. Once the ceremony has concluded, they tend haul off the extracted entrails back to their refinery, where they magically transmute their ore into useful materials using a machine called the material processor, which they tend insert into another machine, called a mining fabricator, which transforms certain amounts of certain materials into highly advanced tools. 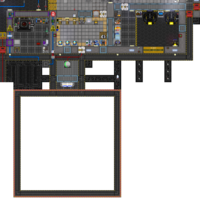 These "Cargonians" also theorize that this "colony" is linked space dwarf homeworld by a special mini-shuttle, controlled by a primitive Space Dwarven computer in a small alcove east of here. Reports of the nature of their homeworld are spotty and unverifiable, but they attest to bizarre magnetic gizmos, a massive black market hub for drugs and highly-restricted Space Pod parts, and a strangely familiar cuisine inspired by 20th century American restaurants. 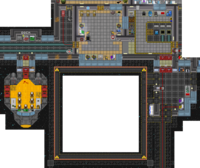 The Mining Department is the base of operations for the station's resident team of asteroid miners, located in the general southeast of the station, past Engineering Tool Storage and Mechanics. When they're not busy trying to mine out the asteroid Chiron Outpost is built into, they're usually calling up smaller versions of it via the mineral magnet and harvesting the ores and other riches hidden inside, using a variety of machines and tools, which they can then haul back into their department via the conveyor belts. There's also a pod bay with a fleet of industrial space pods and all the equipment needed to make them into mining pods. The mining magnet itself is off in the northeast parts of the places, and the shuttle to the Mining Outpost docks just south of that. The APC for the Mining Pod Bay is on the northern wall of that room, above the left table. The APC for the rest of this area is left of the arc smelter. Mining is the base of the station's team of Trench Miners, located in the general southwest of the station. It's basically what would happen if you combined EVA, Pod Bay, & Refinery into an architectural sandwich and then added a tinsy bit of Diner for the extra pick-me-up. In the top right corner, you have a helpful heaping of Pod Bay in the form the Mining Dock. It features not one, but two fairly well-built mining minisubs, a locker of welders to fix them, and various modules that'll make them more useful for exploring the Trench and harvesting its minerals. Below the dock, in the bottom right, is a slice of Refinery. Here, ores and other materials collected from the Trench are processed by the material processor into bars and blocks for the special mining nano-fab, where they can be made into custom tools, and/or the mining fab, where they can used to create higher-level mining gear. There's also a brown chute (heh) for delivering materials to the actual Refinery, plus a quantum telescope for discovering new locations and a handy-dandy tank dispenser. In the top and bottom left sides, you have the slice of EVA, or maybe Engineering Storage. Here, you'll find flippers, magboots, breath masks, and diving suits on racks and power picks, ore scoops, satchels, and mining charges in lockers. There's also a table with healing mini-patches with styptic powder, cargo transporters, and a recharger. Finally, and most importantly of all, this aforementioned table also has four full meals of bacon and eggs, so the Chief Engineer and all three Miners can start the day well-energized from their delicious and nutritious breakfast. There is no vent. Plates of eggs and bacon don't need air. The APC for this entire mishmash is the direct center, left of the quantum telescope. This page was last modified on 28 March 2019, at 01:35.